VegasSlots.co.uk: The Best Free Slots Online! If you're looking for the best online slots in the UK, we have it covered. VegasSlots.co.uk is the no.1 resource for slots fanatics up and down the UK. We have the largest selection of free-play online slots anywhere, and you don't even need to sign up! From slick classic 3-reel games to the latest immersive 3D titles, if you want to try out the best slots games on the web in 2019, don't even think about going anywhere. We're not all online slots, though. If you want to know what's going on in Las Vegas, we have reviews and news on the biggest land-based releases as they hit the gaming floors. If you've stepped into a big UK casino in London or Manchester, you'll have been impressed with the selection of slot machines available. But you're always limited by floor space. There's no such worry online; with sites like VegasSlots.co.uk you can find hundreds of slots games at the click of a mouse. Open one, open five, at once and make your money go further. And, unlike a land-based casino, you can try out all our games absolutely free. Get a feel for the slot, try out the bonus features, then find a top online casino and put your money where your mouth is. It's also worth looking at the RTP (Return to Player Percentage) which slots pay out. This is the long-term, theoretical payout that a slot dishes out to players. While land-based slots struggle to push 90%, online games are more in the region of 92-97%. That's just another long-term reason to play slots online. Play the most popular UK and Las Vegas casino games for free in your browser. Find out where you can play your favorite slot machines online for real money. Read reviews of the newest online casinos as well as established gaming sites. Read about slot games and find out exactly how most slot machine games work. There's so much online slots choice out there in 2019, it's hard to know where to start. That's why at VegasSlots.co.uk, we cover the widest range of slots available. We review the biggest UK progressive jackpots slots that reward multi-million pound prizes every month, and tell where to find the leading software developers like Net Entertainment, Playtech and Microgaming. Not all online casinos or slots are created equal, and you can soon find your bankroll disappearing before you realise that the bonus features are rubbish or the payouts stingy. That's why we'll lead you to the best-paying games on the net in 2019 that make your money go further. Whatever your platform, there's a range of slots just for you. You can enjoy slick graphics and fast gameplay on lots of devices, and many of the top titles cross over into multiple platforms. Desktop - Whether you're on a PC or laptop, thousands of online slots are available for free-play right now. Generally, games download via the web browser so you can enjoy the latest slots instantly. Games are normally powered by Flash or Java; perfect for playing on the web. Mac - While Mac users traditionally struggled with playing many Flash-powered games on their Apple machines, there's a much wider choice in 2019. And with the Mac's powerful processor you'll find hundreds of slots that work on the latest Macbook. 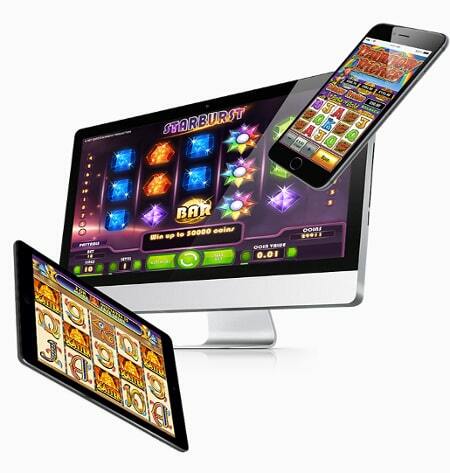 iPad/iPhone - With the evolution of mobile casinos, slots on your smartphone or tablet have never been so accessible. Developers are hurrying to adapt their popular online slots into versions that will work on a small touch-screen, but there's usually no loss of gameplay. Whether you're playing the big Microgaming progressives or a classic NetEnt title, there will be a decent version available for play on the go. Android - With Android releasing their latest Lollipop operating system, and with games powered by HTML5, it's never been a better time to enjoy slots on your Android phone or tablet. Games can be downloaded to your phone or played via the browser; the choice is yours. Once upon a time, a 3-reel fruit machine was the best you could expect for a UK player. These days, you can still enjoy 'classic' 3-reelers with minimal paylines and no bonus features, like Bally's Quick Hit, but there's plenty more out there. 5-reel video slots offer upwards of 20 paylines (and some developers offer up to 1,024 lines) with bonus features galore like Free Spins, instant cash wins and wheels of fortune. From simple NetEnt slots like Starburst to big-budget 3D titles like BetSoft's After Night Falls, there's something for everyone. The best thing about online slots is the huge progressive jackpots that can be won. Progressives take a small percentage of each bet placed and pool mega prizes across multiple casinos. This means you can win prizes worth millions of pounds if you trigger the right combination or bonus feature. Check out Microgaming's Mega Moolah or The Dark Knight for two of the biggest prize payers of 2019. The lines between slots and video games are starting to blur, though. In 2019 you can see slots emerging online that feature 'skill' bonus features that involve target practice or navigating a maze in order to win cash. Playing slots online is a fun and frantic pastime, but involves betting real money. While the majority of players can gamble without getting into trouble, for a small percentage their gambling can get out of hand. Sensible gambling on a basic level is about managing a bankroll. It means never gambling more than you can afford to lose and setting yourself loss (and win) limits where you stop playing and switch off the PC. Luckily, there's help at hand for players who think they might have a more serious problem. Expert resources in the UK like Gamblers Anonymous and GamCare, which provide support, advice, and free counselling to any British slots players looking for help. If you want to play the biggest range of freeplay slots on the web, you'll find them all at VegasSlots.co.uk. And if you are completely new to slots, you'll find guides to playing the games, as well as discover the best ways to beat the slots and win the big jackpots.